While visiting your dentist regularly for cleanings and checkups is the best way to maintain your oral health, did you know there are actually a number of things you can also do at home to maintain healthy teeth? You can actually get a lot done at night, right before bed, without adding too much time to your regular routine. Here are some nighttime tips for improving your oral health from your dentists in Patchogue. Not only does it do all the hard brushing work for you, it actually times you to ensure that your teeth are getting their full two minutes of brushing time. Hygienists report that patients who use an electric brush, as opposed to brushing by hand, have less plaque build up in between dental cleanings. Switching to an electric brush is a small investment to make in your oral health, and you’ll never have to worry about your brushing technique again! Using an antibacterial mouth rinse before bed helps reduce the bacteria that can form plaque on your teeth while you sleep. This will protect your teeth from decay and cavities and your gums from gingivitis. Not all mouth rinses are created equal however, so be sure to discuss with your dentist which one will best meet your needs. Patients who clench and grind their teeth at night are putting their teeth at a higher risk of wear, chipping, and fractures. How do you know if you grind your teeth at night? Your dentist will look for excessive wear on your teeth at your checkups. Some patients wake up with tenderness in their jaw, or headaches, which can be an indicator of grinding, or bruxism. A night guard, which is worn much like a retainer or sports guard, can be worn during the night while you sleep in order to protect your teeth and relax your muscles. As important as brushing your teeth, flossing removes plaque build up from in between your teeth. Yes! You can actually get cavities in between your teeth. 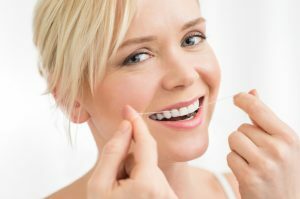 Not only does flossing remove food particles and plaque, it also strengthens and promotes healthy gums, which are the foundation for healthy teeth. Don’t forget to floss – it really doesn’t take that long. Dr. Gary Rosenfeld, Dr. Julie Boerger, Dr. Jessica Henner, Dr. Michael Wakily, and Dr. Benjamin Neren are your trusted Patchogue dentists. Our goal is to help you achieve and maintain optimum oral health for lifetime, and we do this best through preventative care. By being proactive about your oral health, you can avoid many dental issues that are costly and invasive. Give us a call today to get your next appointment scheduled.